Home » So Many Denominations—What Is the Best Church? Various religious groups that originated in the past couple of centuries, such as Jehovah’s Witnesses and Mormonism, argue that the very multiplicity of denominations in Christianity is proof that a “restoration” is needed. Each of these modern sects claims that it alone is the one true church, the only acceptable form of Christianity. If you have come out of one of these restorationist groups, or if you are thinking about doing so, you are very likely overwhelmed by the prospect of trying to find a church. How can you be confident that you are not simply leaving one false sect for another one? How can you hope to find the needle of the one correct organization in the haystack of thousands of denominations? 1. There is no one true religious organization. I have good news: you can relax. It is not necessary for your salvation to find the needle in the haystack. In this article, I’m not going to tell you “which church to join.” I’m not going to argue that one particular denomination is the only true church. To the contrary, the assumption that there can be only one acceptable denomination or church organization is unbiblical. There can be only one true Christian church worldwide, but it may be represented by numerous institutions or organizations. That is, while the New Testament teaches that there is only one body of Christ (Rom. 12:4-5; 1 Cor. 12:12-13; Eph. 4:4; Col. 3:15), it does not teach that there is only one corporation, religious hierarchy, or formal institution that represents the body of Christ. The one true church is the people who compose the body of Christ, not an organization that claims to rule over the people of God. The gospel is not a call to find the right organization and join it. Rather, the gospel is a call to come to the only Savior and join him. In coming to Jesus Christ in humble faith, trusting in him alone to save you from your sins (not in Jesus plus your own good efforts or Jesus plus your religion’s rituals), and accepting the Bible as the authoritative revelation of Jesus, you will find yourself drawn to his people. And as you get around, you’ll find that Jesus has people in a variety of denominational organizations. Just as there are no perfect Christians, there is no perfect church—just the community of people who believe the same gospel as you do. 2. There are really only five basic groups or types of religious bodies claiming to be Christian churches. 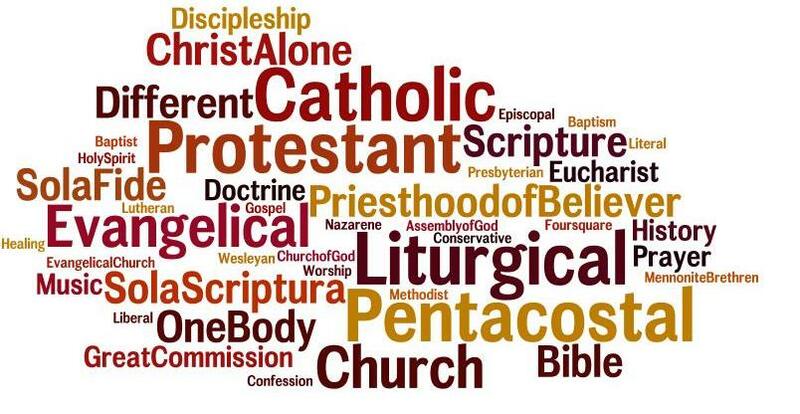 Although there are thousands of Christian denominations and sects, we can boil down all of this bewildering diversity to five basic categories: Catholic, Eastern Orthodox, Liberal Protestant, Evangelical Protestant, and Other. Let’s look briefly at each of these five categories. a. Catholic Church. About 1.2 billion people—about half of all Christianity—are found in the Catholic Church. The Catholic Church claims to be the only true church in an institutional sense, though it accepts other Christians outside its walls as fellow believers. What we know today as Catholicism developed in several stages. Beginning around the seventh century, the bishop of Rome (called the Pope) gradually came to exercise more and more powerful leadership or rule over other Christian churches, especially in Western Europe. Tensions with churches in Eastern Europe led to the Great Schism in the eleventh century, in which most (not all) churches aligned themselves either with Rome (Catholicism) or various Eastern bishops (Orthodoxy). The Protestant Reformation of the sixteenth century reacted against teachings and abuses in Catholicism and led within the Catholic Church to various reforms. In the nineteenth century, the Catholic Church proclaimed as dogmas the belief in Mary’s sinlessness and in the infallibility of the Pope (on certain occasions). b. Orthodox Church. Roughly a quarter of a billion people belong to the Orthodox or Eastern Orthodox Church. The distinctive claim of Orthodoxy is that the church is ruled by bishops in fellowship with the patriarch of Constantinople, one of several patriarchs in the Orthodox tradition. Eastern Orthodoxy remains strongest in Eastern Europe and in Russia, though it is also found in many other parts of the world. c. Evangelical Protestantism. Roughly half a billion people are part of the evangelical Protestant tradition, which originates from the Reformation. Its two main distinctive beliefs are a generally conservative view of the Bible as the only infallible written word of God and its understanding of the gospel as a message of salvation by grace alone through faith in Christ alone. Some of the larger evangelical Protestant denominations include the Christian & Missionary Alliance, the Christian Reformed Church, the Evangelical Free Church of America, the Lutheran Church—Missouri Synod, the Nazarene Church, the Presbyterian Church in America, the Salvation Army, the Southern Baptist Convention, and the Wesleyan Church. It also includes many if not most of the denominations known as Pentecostal churches, notably the Assemblies of God. The number of evangelicals worldwide has been variously reported depending on whether the reports counted such Pentecostals and charismatics. The World Evangelical Alliance, which includes Pentecostal and non-Pentecostal evangelicals, is an international fellowship of evangelical denominations and associations totaling about 600 million people. d. Mainline Protestantism. Many of the denominations that emerged from the Protestant Reformation went through major theological changes in the nineteenth and twentieth centuries, embracing or at least tolerating to a significant degree the influence of liberal theology. Liberal theology denies the infallibility of the Bible and questions much if not all of the supernatural aspects of the Bible’s accounts and teachings. Thus, members of mainline Protestant denominations may or may not accept the virgin birth of Christ, and they may even question his resurrection. About a quarter of a billion people belong to these mainline church bodies which include the American Baptist Churches, the Episcopal Church, the Presbyterian Church USA, the United Church of Christ, and the United Methodist Church. The Evangelical Lutheran Church in America, despite its use of the term “Evangelical,” is a mainline denomination. Still, many individuals and even whole congregations in most of these denominations are evangelical in their beliefs. It’s worth pointing out that this category of Christianity for all practical purposes did not exist when the “restoration” groups began appearing in the nineteenth century. In Joseph Smith’s day, for example, all of the churches he had considered joining were evangelical Protestant churches. Liberal theology was just beginning to develop at the time that Christian Science and Jehovah’s Witnesses appeared in the 1870s. For the most part, restorationist forms of Christianity were reacting against Bible-believing Christian denominations. e. Other. Roughly a quarter of a billion people adhere to forms of Christianity that do not fit into any of the aforementioned categories. Within this none-of-the-above category is a wildly diverse assortment of religious communities. It includes British-Israelite groups, Christian Science, the Family, Jehovah’s Witnesses, Latter-day Saints (Mormons), New Thought, Oneness Pentecostalism (which is a heretical offshoot of Pentecostalism), Rosicrucianism, the Sacred Name movement, Swedenborgianism, the Unification Church, Unitarian Universalism, The Way International, and many, many others. These diverse groups all share in common a rejection of historic Christian doctrine as represented, for example, by the Nicene Creed. That is, all of these groups reject the doctrine of the Trinity. All of them deny either that Jesus was Almighty God in the flesh or that he rose from the grave, or both. All of them reject the doctrine of salvation by grace alone. Now, you can be an orthodox (little “o”) Christian, accepting the biblical gospel of salvation by grace alone through faith in the true God revealed in Jesus Christ, and be an active member in any of the first four categories of Christian churches (Catholic, Orthodox, Evangelical, and Mainline Protestant). That doesn’t mean we would recommend all four, but there are many gospel-believing, genuine Christians active in all of those categories. The fifth category is the one that must definitely be avoided. The religious bodies in that category all reject the biblical gospel and all radically misrepresent the biblical teachings about God, Jesus Christ, and other essential matters. While it may be possible to be a member of one of these sects and privately believe in the biblical gospel, it is not possible to be a practicing, faithful member adhering to such a sect’s teachings and also accept the true gospel. For all of the differences among Catholics, Orthodox, and Evangelical and Mainline Protestants, all of the denominations in these four categories officially teach the same basic doctrines about God and Christ. All of them teach the same doctrine of God: one Creator of the universe who exists eternally in the three persons of Father, Son, and Holy Spirit. All of them officially teach the same doctrine of Jesus Christ: the eternal Son of God incarnate—fully God and fully man—crucified, risen physically from the grave, ascended into heaven, and personally returning in glory to perform the Final Judgment. 3. There are basically three questions you need to answer for yourself as you think about the kind of church you want to call home. These three questions concern your view of the gospel, Scripture, and the church. Assuming you have settled in your mind the truth of the historic Christian view of God and Christ just mentioned, there are three more basic questions to consider with regard to finding a church home. Gospel. The first and most important question is what you understand to be the gospel. While all four major branches of historic Christianity agree on the basis facts of the gospel (Jesus died on the cross and rose from the dead), they differ, sometimes markedly, in the way they explain the gospel itself. The Catholic Church and the Orthodox Church both affirm salvation by grace alone, but in practice their teachings about sacraments, the church, and works leads many to think of salvation as a cooperative venture in which God does his part and we do ours. In Catholicism and Orthodoxy, the church becomes a channel through which the blessings of God are dispensed throughout a person’s life, specifically in the sacraments. This makes participation in sacramental rituals into a means of salvation. We thank God that there are Catholics and Orthodox believers who are trusting in Christ alone for their salvation, but their doctrines and rituals have the net effect of undermining such exclusive faith in Christ alone for millions of their members. In the mainline Protestant churches, some pastors and teachers proclaim the biblical gospel of salvation by grace alone through faith in Christ alone. Others do not, either by neglect or by preaching and teaching against this understanding of the gospel. If you are considering a mainline denominational church, take this diversity into account, and make sure that the specific congregation you are joining faithfully proclaims the gospel. Scripture. Historically, Catholics, Orthodox, and Protestants have all agreed that the Bible is Scripture, the divinely inspired word of God, infallible in its teachings. However, many individual members of all three traditions no longer accept this basic premise of Christian theology (although the Catholic and Orthodox Church both officially teach this view of Scripture). In particular, mainline Protestant denominations have for the most part abandoned the infallibility of Scripture, and many of its seminary professors and its pastors actively teach against the traditional Christian view of the Bible. For this reason, we would urge some caution about seeking membership in any of the mainline Protestant denominations, even though we recognize with gladness that there are evangelical Christians within them who do uphold the conservative view of Scripture. The tradition that maintains the staunchest and most consistent emphasis on the trustworthiness and authority of Scripture is that of evangelical Protestantism. Evangelicals affirm the supremacy of Scripture as the final authority for Christian doctrine. Councils are limited, religious leaders are flawed and fallible, but the word of God in Scripture can always be trusted. Church. If you take the position that the church needs to be or have a single religious organization or formal institution that represents all true Christians everywhere, then, within the parameters of traditional Christianity you have two choices: the Catholic Church or the Orthodox Church. If on the other hand you accept the possibility that various institutional church organizations might all be part of the body of Christ, then you are at least in practice in agreement with the Protestant view of the church. As evangelical Protestants, we accept the evangelical view of Scripture as the final doctrinal authority for Christians and the Protestant view of the church as the body of Christ with members in many different denominations and individual congregations. Again, though, we recognize that there are genuine Christians who disagree and who are not members of evangelical churches. 4. The differences among evangelical Protestants are for the most part relatively minor, dealing with secondary issues that do not affect salvation. These issues may be fairly important, but they are not essential matters in the way that one’s view of the nature of God or of salvation is essential to the Christian faith. Each denomination has its own views on these issues, and you can familiarize yourself with them and decide which denomination holds views most compatible with your own. 5. Focus on finding like-minded believers, not on finding the perfect church. We all need to be part of the Christian church, to be in fellowship with other believers for the purposes of worship, teaching, evangelism, and service to others. It is more important to find a reasonably healthy congregation of people who share your values concerning the basics of the Christian faith than it is to identify the best denomination. It is most important to find a church that does the following four things: (a) affirms the essential doctrines of the faith, (b) preaches the gospel of salvation by grace alone, (c) upholds the Scriptures as the absolutely reliable word of God, and (d) teaches the unity of all believers in the gospel. If you agree with these principles and you find a church that does so as well, you’ve found a good church! Bowman, Robert M. Jr. Denominations Comparison. Torrance, CA: Rose Publishing, 2003. This glossy pamphlet provides an overview of twelve major families of church bodies (Catholic, Orthodox, Lutheran, Anglican, Presbyterian, Methodist, Baptist, Pentecostal, etc. ).